Texas A&M University at Galveston offers many financial aid options to help you cover your college costs. Within this site, you will find information about applying for financial assistance, costs, types of aid, and more. Scholarships are a form of financial aid that assist students with the cost of education. Scholarships are awarded on the basis of academic achievement, extracurricular activities, volunteer services, employment, and on some cases financial need. Scholarships are designed to reward, encourage, and assist students in pursuing academic excellence and leadership roles. Scholarships do not need to be repaid but may have specific criteria for you to remain eligible (i.e. grade point average, major, course load, etc.). See more information on maintaining eligibility here. Be sure to complete the Free Application for Federal Student Aid (FAFSA) for need-based scholarships. The Texas A&M University School Code for the FAFSA is 003632 with a priority deadline of December 15. For incoming students, including freshman, transfer, and domestic graduate students, all required information is included within the Apply Texas admissions application. Be sure to complete the scholarship portion of the Apply Texas application to ensure you are considered for scholarship opportunities. For continuing students, the University Scholarship Application must be completed each academic year for institutional scholarship consideration. The online application must be completed by February 1st. Scholarship recipients are primarily selected by a committee of faculty and staff from across the university who utilize applications, GPA information, and department nominations to choose recipients. In some cases, the selection is made directly by the donor of the scholarship funds. If you would like additional information on any specific awards, feel free to contact the scholarships office at (409) 741-4395 or scholarships@tamug.edu. Please note that students graduating prior to the upcoming academic year do not need to complete the University Scholarship Application. When received, scholarship funds will be credited to your billing statement. For scholarships of $1,000.00 or more, the funds will be split evenly between the fall and spring semesters, unless otherwise directed by the organization granting the scholarship. Scholarships less than $1,000.00 are applied toward the fall semester only, unless otherwise directed. Each scholarship program requires students to meet certain basic elements of hours completed and cumulative GPR. Recipients of multiple scholarships, will have their GPR eligibility evaluated individually for each scholarship. All scholarship recipients must be enrolled full-time (12 hours) for their scholarship to pay towards their account each full semester (fall and spring). Scholarship recipients that begin their enrollment at Texas A&M University during or after the summer 2013 term (i.e. Class of 2017 and subsequent class years) are required to have earned 30 hours by the end of their first academic year, 60 hours by the end of their second academic year, and 90 hours by the end of their third academic year. An academic year entails the fall, spring, and summer terms. Hours earned via transfer credit, dual credit, and AP/IB testing may be used towards the completion of this requirement. 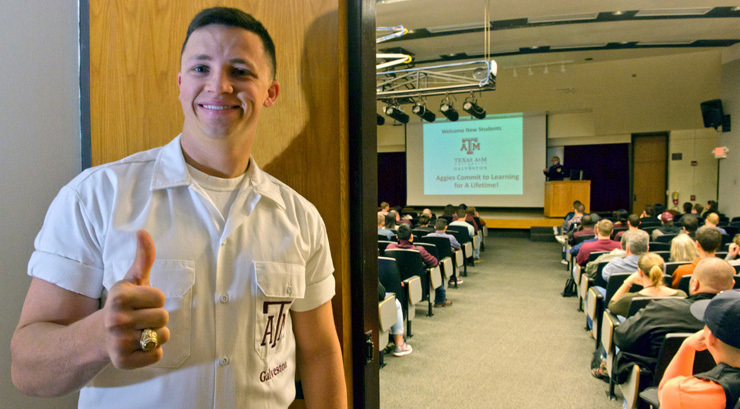 Students that began their enrollment at Texas A&M University prior to the summer of 2013 (i.e. Class of 2016 and prior class years) are required to enroll in and complete a minimum of 12 credit hours per full semester (fall and spring) at Texas A&M University. Credit received from other institutions, as well as summer credits, may not count towards the completion of this requirement. For additional information on maintaining eligibility for all forms of financial aid, click here.